Are you shopping for Zodiaq® quartz countertops in the Maryland, Virginia, and DC area? You’ve come to the right place. From colors and pricing to the benefits of quartz vs. granite, this guide will answer all of your questions about one of the most highly demanded brands of quartz countertops. There are many types of countertops out there, but people all over favor DuPont™ Zodiaq quartz countertops for a number of different reasons. Ready to give your home an elegant and unique look? 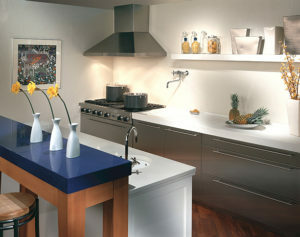 Keep reading to learn the benefits of outfitting your kitchen or bathroom with Zodiaq quartz countertops in Maryland. If you’re ready to contact our friendly countertop experts, give us a call at 888-675-9513 or click one of the buttons below to find out how easy it is to get a custom quote. DuPont™ Zodiaq Countertops are 93% pure quartz crystal. This gives Zodiaq quartz countertops an unrivaled natural depth and radiance without the imperfections that are commonly seen in unimproved stone like granite. Because quartz is nature’s strongest non-precious stone, Zodiaq quartz countertops are incredibly strong, durable and can resist heat as well as scratches. Bonus: The best part about having your countertops installed by Express Countertops is that we fabricate everything in-house, allowing you to customize the size, shape, backsplash and overhang of your countertops. The Zodiaq counters available for your home are composed of almost 100% quartz. This gives them exceptional toughness and a hardness rating of 7 on a scale of 1-10 (diamonds rate a 10 on this scale). With a material this durable, you can be sure that your countertops will stand strong and look great. If your children are ‘little chefs’ or there is an avid cook in your home, Zodiaq countertops’ durability make them a great choice. The stunningly smooth and nonporous surface of Zodiaq quartz countertops resist even the toughest of stains, and they are able to retain a natural luster for many years with no need for sealants or waxes. This resilient material is perfect for food preparation surfaces or vanity tops. What does this mean for you? Your initial investment in your countertops will be well worth it in the long run as you won’t have to continually pour large sums of money into the upkeep of your counters. Zodiaq surfaces can be cut to fit exact and specific requirements. This allows you a very wide range of potential design options, including custom edges, overhangs, backsplashes, and more. When designing your kitchen with Zodiaq quartz countertops in mind, you can make the material work for you, rather than having to work with the material. Zodiaq quartz countertops come with an unmatched ten-year limited warranty from DuPont. Should something go wrong, you won’t have any trouble getting it remedied. How much does Zodiaq quartz cost? Prices can change for different colors of Zodiaq quartz countertops, but the average project costs between $35-$100 per square foot. That’s a wide range, but there are a lot of factors that influence your countertop costs. If you’re interested in getting an accurate quote quickly, click below to fill out our estimate form. When you upload a photo of your kitchen, our software can analyze the space and deliver a custom quote within 2 business days. No matter what theme you have in mind, there’s sure to be a color option out there that makes it possible to pull off. Explore the swatch gallery now to find the perfect color for your kitchen or bathroom. To see samples of Zodiaq countertops, you are also welcome to stop by our showroom Mon-Fri between 9am-5pm at 7255-D Standard Drive Hanover, MD 21076. Zodiaq quartz surfaces are extremely easy to maintain mainly because of their durability, their non-porous surface and their resistance to chemicals. Zodiaq Counters require no sealants or waxes in order to retain their natural gloss and their ultra-smooth surface. Day to day cleaning can be done with a damp paper towel or cloth and, if it is necessary, a tiny amount of a non-bleach and non-abrasive cleanser. Spills should be wiped up as quickly as possible. You can use a non-abrasive cleaning pad along with a non-bleach cleaner to assist in the removal of stubborn or dried spills. Zodiaq Counters are resilient against heat, scratches, and stains. Despite its resilience, we still recommend the use of hot pads or trivets when dealing with hot items. Can Zodiaq countertops be used for food preparation? DuPont™ Zodiaq quartz countertops are non-porous and can easily and safely be used in a kitchen, or anywhere food is prepared. A cutting board is recommended when slicing or chopping food, especially if you are using a serrated knife. Ready for a fast, free Zodiaq countertops quote? Getting the perfect counters is something that only happens when you work with a supplier who has experience in helping people get the look they want at a cost they can afford. With the professionals here at Express Countertops, you will get exactly that. Call us today at 888-675-9513 or click here to get in touch with us online to make sure you get countertops that are perfect for your home at a price that fits your budget. Zodiaq kitchen countertops are one of the top requested projects in Baltimore, Annapolis, Alexandria, Fairfax, and other cities throughout the Maryland/Northern Virginia area. Now it’s your turn to find out why!